Topwater – Look around high-current points where there is access to deep water. Submerged rocks and other cover are a plus. Set up downstream and fan-cast into the direction of the current starting closest to shore. Look for the rip, that is a change in the waves around the point and work that area hard. On calm days, use a spook. In rougher water, try a big popper. Heddon Super Spooks, Lonely Angler Zipsters, and Stillwater Smackits are great lures for this time of year. Breakers – It’s time to look on both sides of Poplar Island, north of Sharp’s Island Light, and at Western Shore locations like the mouth of the Severn and South Rivers, off the Radar Towers, and near Parker’s Creek . Reports are sporadic, but look for schools of very nice fish blitzing over depths of 25-35 feet. Throw very big topwater plugs with big hooks into breakers (like a full-size Stillwater Smackit). 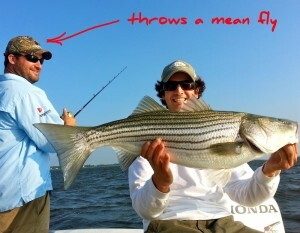 The small fish will hit at the plug, but they can’t get it in their mouths and the big hooks won’t usually catch them. The bigger fish will come to investigate and take the big lure. Don’t throw small lures or lures with fly trailers into breakers – you’ll just harass the little fish. If all the fish you’re catching seem small, move on a nd look for another school of bigger fish. When breakers go down, watch for them to come up again nearby. Circle around on the up-current side of the school. Stay on the outside and cast in. Kill your engine and the fish will stay up longer. Submerged humps, structure, and ledges – Chasing breakers is fun, but fishing underwater ledges and structure will give you your best chance for summer trophies. Look on your chart for humps or ledges that interrupt the normal flow of current. For example, when the current is flowing north to south, look for an east to west ledge or structure. The Kent Island Sewer Pipe is a good example. If the current is running east to west like it does in the rivers or in places like Eastern Bay, look for a north to south ledge. 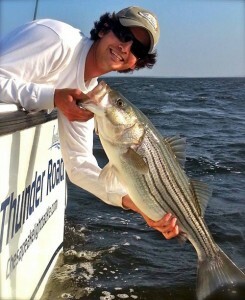 Underwater humps and ledges increase turbulence and attract baitfish and eventually stripers. If you’re chasing breakers and they go down and don’t come back up, motor over to the closest ledge to see if they might be holding there. 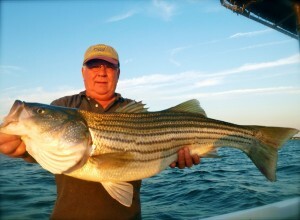 The Chesapeake Bay Bridge – The Bridge usually turns on in June and the fish can be on any piling. Set up down current and cast toward the direction of the flow. You want the lure to move downstream with the current, not against it. Don’t worry if you don’t see marks on the sonar. In fact, it’s better if you don’t motor around close to the pilings because you’ll scare the fish. 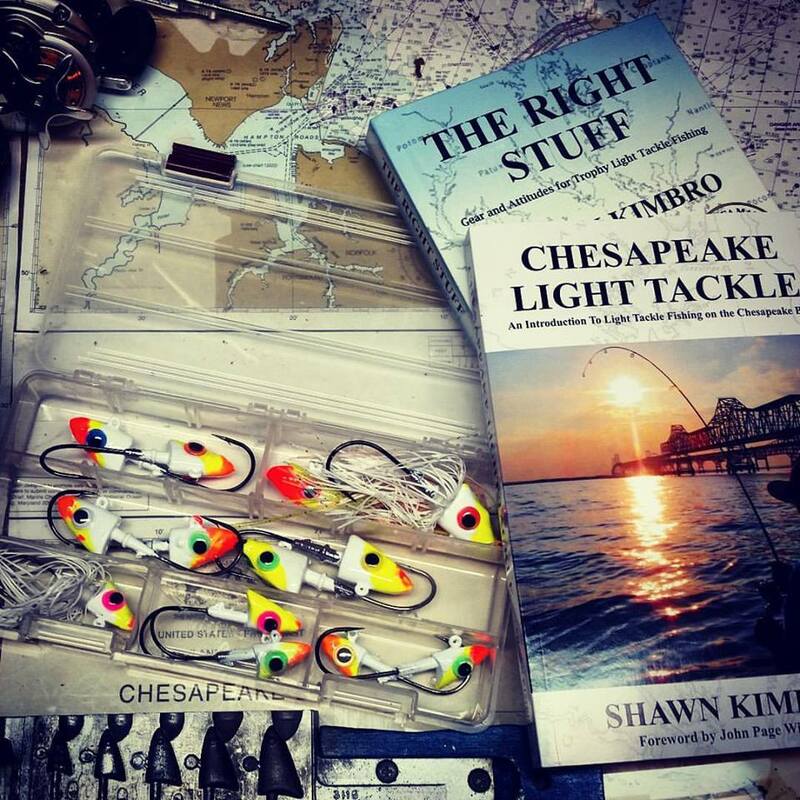 Just cast and let your lure be your fish finder. I generally start shallow and hit a couple of spots, making sure my jig touches the bottom or the concrete base of the piling on every drop. If I don’t get bites, I move on to intermediate depths around 20-feet, still always touching the bottom. If nothing is there, I’ll check the deeper pilings, this time aiming my casts so that the lure falls down on to the submerged crossbars. With a little practice, you can find the crossbars and learn how deep they are on individual pilings. Try to get your jig to bounce a couple of times on top of the bar, then let the lure fall to check for fish immediately under the cross bars. Jig all the way back to the boat because sometimes fish will follow your lure. 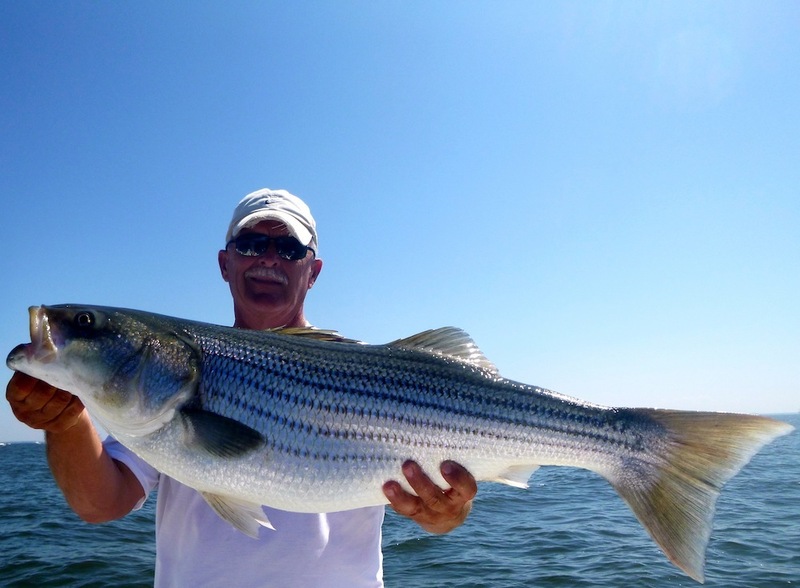 Suspended Fish – When the water starts getting warmer bait will often suspend in comfort zones called pycnoclines and the stripers will follow. 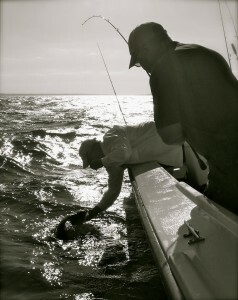 Suspended fish are usually hard to catch, but they can be coerced into biting with the right presentation. Use smaller soft plastics like 5-inch Gulps or 6-inch BKDs. Use light jigheads. You want your lure to be just heavy enough to drift into the zone where the fish are holding, but not so heavy that it falls too quickly. Sometimes an 8th of an ounce can make a big difference in the number of strikes you get. Set up so that you are drifting over the fish as long as possible and remember the old saying, “When the wind’s in your face, you’re in the right place.” Think of your presentation like teasing a cat. Try different types of action in your lures. Use scents and color contrasts. Be patient. Suspended fish marks are usually sparse. Just one or two on the screen at a time is often enough. Be patient. If you feel a tick, set the hook, because suspended fish usually bite lightly. If you miss, jerk the lure quickly a few times to entice the fish back to your bait. 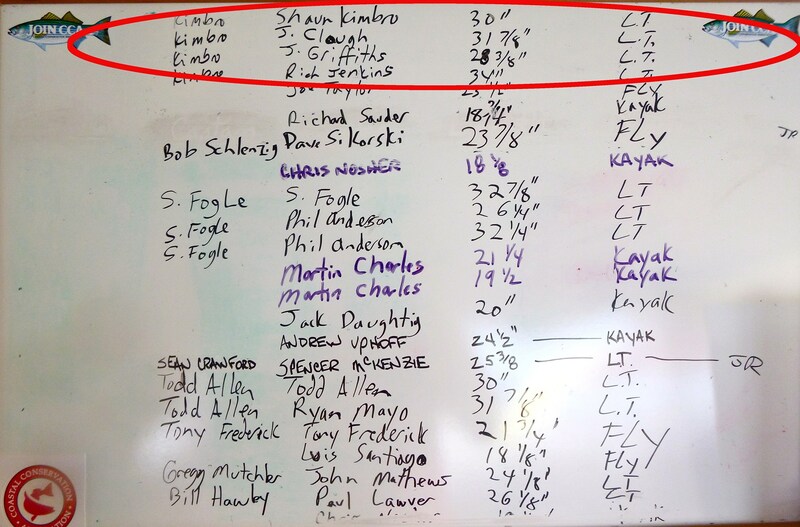 Here’s a shot of Saturday’s leaderboard with a shout out to Dave Sikorski, 1st Place Fly Division, and Andrew Uphoff, 1st Place Kayak Division. Steve Fogle and Phil Anderson were hot on Rich’s heels and took 2nd and 3rd overall. Chumming and trolling is producing 20-inch fish right now. Casting gets the trophies. Good luck casting! Awesome, LTJ in a nutshell, thanks and congrats. Wow! LTJ in a nutshell is right. Maybe a sentence or two on snake oil…err strike triggers is all thats missing in this concise article. What a great time at the Tourney and party! Great event done right, catch-photo-release.